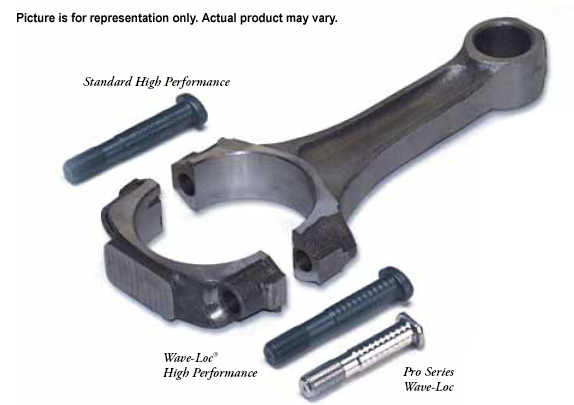 Because factory connecting rods (or aftermarket versions of OEM rods) are used in a variety of applications from rebuilt stock motors to modified powerplants used in circle track, marine and drag racing engines - including those with superchargers and/ or nitrous oxide injection systems - ARP offers replacement rod bolts that are substantially better than the stock OEM and most aftermarket bolts. For the most severe applications, in conjunction with aftermarket I-beam rods, ARP has developed the "Pro" Series Wave-Loc bolts. These ultra heavy-duty rod bolts are made from a special material designated ARP2000. It has approximately 200% the fatigue life of 8740 chrome moly steel and has a tensile strength of about 220,000 psi, and is capable of more than 12,000 lbs. clamping force.